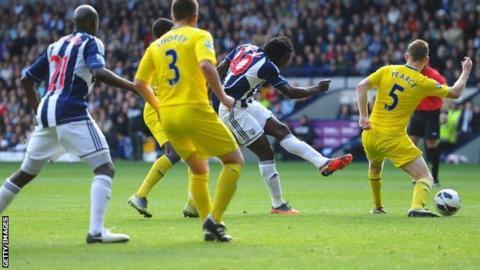 Romelu Lukaku struck on his full debut as West Brom deservedly continued their excellent start to the season at the expense of struggling Reading. Lukaku collected Shane Long's knock down before beating Alex McCarthy from 18 yards with 14 minutes remaining. Jonas Olsson had earlier hit the post and McCarthy twice denied James Morrison as West Brom dominated. The result takes Steve Clarke's team up to third in the Premier League, while Reading have slipped to the bottom. Brian McDermott's Royals have only a solitary point from their first four games since returning to the top flight. In truth, there was not a huge amount between the two teams during what was a pretty mediocre match, but the Berkshire club have now conceded eight in their last three league fixtures and did not create many chances against the Baggies. Reading looked to wide men Jobi McAnuff and Garath McCleary as their prime attacking outlets but apart from one spectacular overhead kick from the latter in the early stages and a header that narrowly missed from substitute Hal Robson-Kanu late on, they struggled to break down the Baggies' backline. Adam Le Fondre buzzed around trying to influence the game but fellow forward Pavel Pogrebnyak was a peripheral figure and was withdrawn after 69 minutes. The Royals did have two penalty appeals, after surging runs from McAnuff were ended by Billy Jones, but referee Chris Foy denied them both. While there are plenty of problems for McDermott to tackle, Albion boss Clarke can take great satisfaction as his side quickly put behind last weekend's 3-0 defeat at Fulham behind them. Their 10 points from five games is the club's best start to a Premier League campaign, and they have conceded in only two of their last 10 games at The Hawthorns. Albion started both halves in lively fashion and McCarthy had to make an early low save to deny Morrison, who later in the opening half snatched at a shot after Zoltan Gera picked him out. The lively Lukaku, making his full league debut for the club, wasted a promising position shortly before the interval with a heavy touch that allowed Chris Gunter to make a covering tackle. From the subsequent corner Olsson almost scored but his powerful header hit the top of the post. The pattern continued after the break, with Reading keeper McCarthy making another excellent save to thwart a Morrison volley from long range, while Gera saw an effort blocked. Long came off the bench against his former club after 65 minutes and quickly played his part in the game's only goal. Lukaku's shot was hardly the most powerful effort on goal and was fairly central but McCarthy was unsighted as the ball passed through a team-mate's legs. West Brom boss Steve Clarke: "Last week's 3-0 defeat at Fulham was our worst performance of the season but we have started well at home and we came into this game confident but respectful of Reading. "We just kept plugging away, it was always going to be a tight game. You could see halfway through that it might be a first goal wins it type of game and eventually we stuck one away. "After three home games it is pleasing to look at the stats but there is a long way to go. If we can keep our form at home it will be good for us this season." Reading boss Brian McDermott: "We need to create more chances because if we do we will score goals. "We felt the game was drifting towards 0-0 and it was always going to be a case of one goal making the difference and they scored it. "We were better than we were against Spurs and we felt we should have got something but this league is unforgiving. "We have to move on quickly, which always do. We just need to stick together, which we have done for a long time. The players have been successful in the past and they will be again."